I think it’s important to share ALL sides of the entrepreneurial journey – the highs, the lows, the light and the dark. When I talk about how I’ve begun to unravel things like resistance, fear and vulnerability I know to expect a flurry of comments and messages asking about HOW to actually do that. I’m a big supporter of therapy and working with trained professionals to meet you where you are at and provide tools and resources. I’m also a huge proponent of reading and constantly learning from those that have gone before us. In this post I’m recommending three books that I’ve read, and continue to revisit. They have all really helped me quiet my mind, process the fear and vulnerability, and through their lessons – have allowed me to actually move through those feelings instead of remaining stuck. These books have been literally life changing for me personally, and professionally. I have this one both in audio and hardcopy, and I listen to snippets of it all the time. “Fear is good. Like self-doubt, fear is an indicator. Fear tells us what we have to do. Remember our rule of thumb: the more scared we are of a work or calling, the more sure we can be that we have to do it. Resistance is experienced as fear; the degree of fear equates to the strength of resistance. How freakin’ powerful is that?! If it meant nothing to us, there would be no resistance. 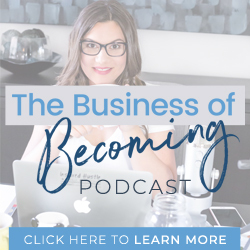 For me, specifically, it was my newest venture, The Business of Becoming podcast as I’ve talked about before that this project was a long time in the works, and it means a great deal to me. I’ve *only* been talking about it for three years. Three years!! Can you imagine how big my podcast would be if I actually did it three years ago?! That’s something I continue to struggle with, and the resistance around that is exceptionally palpable for me. Because I know, internally, that once I start having these kinds of conversations, it’s going to open up my business – and my world, in a way that I don’t know what that is yet, and that’s scary. And while that’s scary, it’s still not a reason not to do it. This is a book I read when I was in a really dark place, and it really helped me to understand that the voice in my head isn’t actually… me. It’s just that monkey mind of ours, and it’s those stories and scripts that continuously play out in your head. They’re not the truth. They’re based upon your experiences, and what your world view is of things. You can delete the scripts or better yet, you can rewrite them. This is important to your business because you likely have thoughts like, “who am I to do this?”, “can I really help anyone?”, etc. But remember, those thoughts aren’t you – you get to decide the questions you ask yourself AND you get to decide the answers. Then the last book that I want to recommend, which I actually keep by my bedside and use almost like an oracle. Whenever I’m thinking, “hmm, what do I need to know today?”… I just open it before bed, and read a passage. When I do that, it feels like I’m saying SHHHHHHH!! to my brain. Instead of chasing outcomes, just have deep faith that it will happen – as long as you are in the mindset that whatever happens is exactly the way that it needs to be for the highest good of all. But, how do you make that practical for yourself and your business? 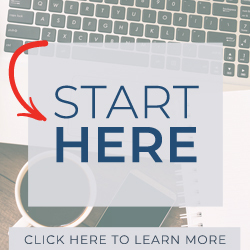 You start by getting really clear on what it is that you want – internally. What do you want your business and life to look like? What do you envision for your life? Leaving the HOW out of the picture, how far apart am I from the vision to where I am now, personally, professionally, financially, health wise – to where I want to be, in say 2 years, 5 years, 10 years? As in, what are the steps that you need to focus on internally, so that you can feel good about WHO you are? Because when you do that, your business will grow. I promise you, your business will grow. This is the hardest but most important work you need to do on your business. If you ignore those things, I promise you…it won’t. And, that’s the truth. I’d love to hear from you now – what books have you read that had the biggest impact on you and your business? I speak more about these 3 books and talk about my entrepreneurial and personal development journey in this Facebook Live.